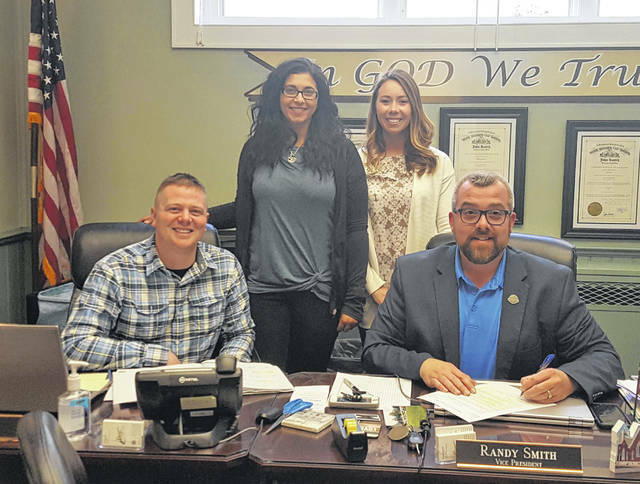 Katie Anderson (back, left) and Melanie Sheets (back, right) joined the Meigs County Commissioners on Thursday as they recognized Autism Awareness Month. Pictured (front, from left) are Commissioners Jimmy Will and Randy Smith. POMEROY — The Meigs County Commissioners recognized April as Autism Awareness Month during last week’s regular meeting. Currently, Sheets’ children receive services through Haugland Learning Center-Athens which is based in Albany. Haugland provides services to individuals and families in classroom-based programs and through a range of services, including, speech therapy, physical therapy, occupational therapy, ABA behavioral consulting, mental health services, home respite, counseling and supportive treatment. Haugland recently opened up their Pre-K program to Meigs County children and provides home services in the county.